We’d like to clearly advise you against bringing any of your vegetarian friends to Surve’s ’cause they don’t have anything that’s vegetarian. It’s purely non-vegetarian! From breakfast to dinner, imagine a place that serves everything made of meat? Live this fantasy at Surve’s, the pure non-vegetarian restaurant where fish, chicken and mutton “meat” deliciousness. 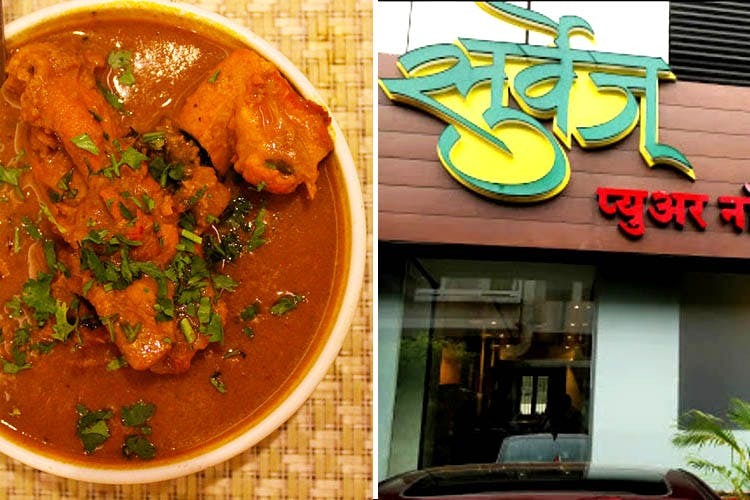 Surve’s specialises in providing their patrons with lip-smacking Maharashtrian home-style delicacies such as mutton curry, chicken handi, bombil chutney and their specialities such as mutton kharda, takkar rassa handi and various others. The maximum you will need to spend on food at Surve’s will not go above INR 500 for two people. At the same time, we recommend that if you are confused with the variety that is provided, simply opt for the thalis they have.